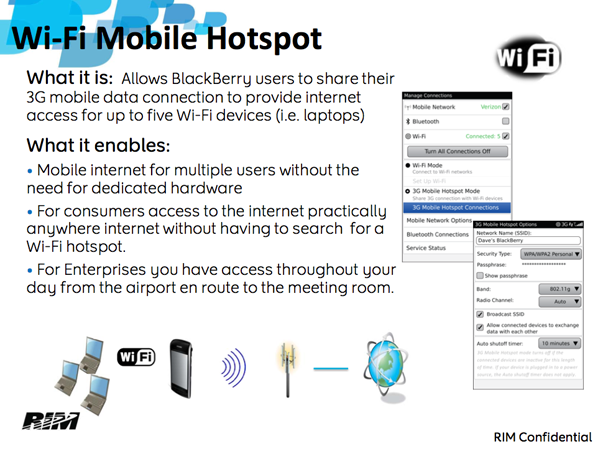 Back when the leaked 2011 road map came out we saw some of the details about BlackBerry Mobile HotSpot and how Research In Motion was expanding upon their devices tethering abilities. After that, not much more information leaked out. Today though, some newer slides detailing the process and what it will all look like have appeared online. Personally, I'm glad to see RIM rolling this feature out finally, since its been known to be arriving since back when the BlackBerry Storm 9570 was outed for the first time. Nice to know that feature didn't die with that device. Jump on past the break for some shots of the UI and further details. 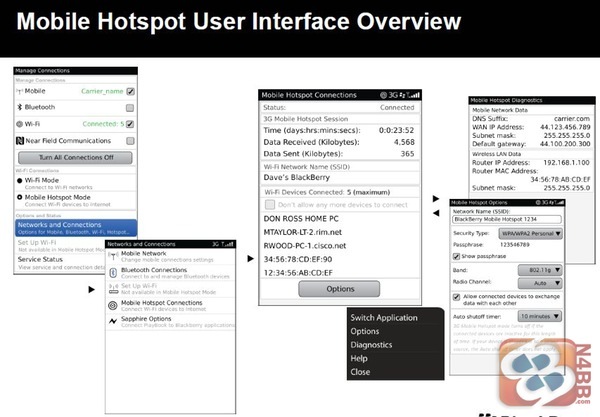 Here you see how Mobile Hotspot will be integrated into the connection manager set up that we know today. 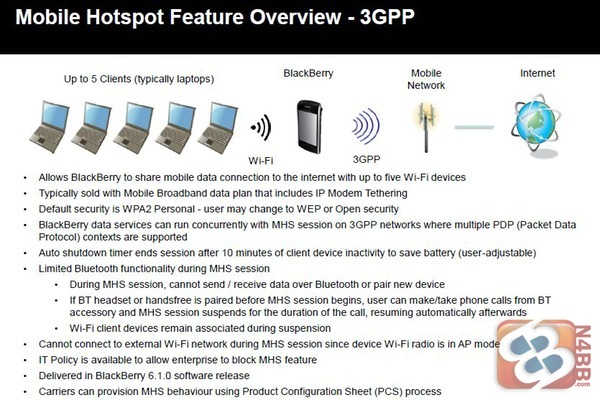 According to the information, the Mobile Hotspot feature will allow up to 5 devices to be connected all at the same time which -- is by all means pretty standard. Another option you'll notice is the NFC portion that is also user manageable just like on the Samsung Nexus S android device. You can enable and disable NFC whenever you do so wish. Since it is RIM working on this, they've also considered security and battery life here. As noted, deafult security is WPA2 and can be changed to WEP if one decides that is more fitting. For battery saving, the auto-shutdown session will start after 10 mins of inactivity. The rather interesting portion here though is that while Mobile HotSpot is un use, only limited Bluetooth activity can be made use of. And finally, what is likely the best news for some users out there. Especially Mac users, tethering no longer requires the use of BlackBerry Desktop Manager anymore. No messing around with software, just set up your device and start using it. Also noted here is that you'll need your carrier info in order for all this to work. not a big deal but folks using unlocked devices often have their APN's set to the original carriers, in which case you'd need to set it to the carrier the device is being used on. All in all, pretty awesome. Just a shame we have to wait for OS 6.1 for it to happen.